Chris continues to study alongside his father attending courses ran by Dennis, such as, the Ligament Articular Balancing or Ligament LAB series, as well as courses on Amatsu Therapy. 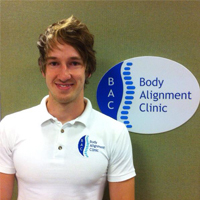 Chris also attends continual development seminars including courses on treatment modalities used by Sports Therapists and Physiotherapists, and also attends courses ran by French Osteopath Jean Pierre Barral. Chris is an honorary member of Health awareness Inc. and is also part of the English Martyrs School and Sixth Form College Sports Stars Academy, assessing, treating and helping to educate the athletes within the programme to the importance of good alignment in maintaining good health and optimum performance. Chris has an insatiable thirst for learning and researching, to gain a better understanding and contributing to Amatsu’s evolvement. Chris has excellent rapport with his clients and interacts with them by text and social media. Chris is no co researching with a local dentist on maintenance and correction of Temporo Mandibular jaw problems. He has a unique skill of simplifying the complex, and has penned patient explanatory leaflets for the Amatsu Therapy Association.